The Southeast Museum of Photography's primary purpose is educational outreach. As a department of Daytona State College the Museum sits on a cultural intersection between the campus and the surrounding community and endeavors to provide educational opportunities for both. The history of the Southeast Museum of Photography begins when Dan Biferie arrived to teach at Daytona Beach Community College in 1975. Biferie noted that there was no exhibit space on campus for students to show their work, or view the work of others. Back then, the school was oriented toward the practical field of commercial photography, and Biferie found himself introducing DBCC - and the general community - to fine-arts imagery and techniques. He soon arranged for the installation of three cases for the display of photographs in his classroom. Another of his "galleries," known as Standing Room Only Gallery, appeared shortly afterward in the lobby of DBCC's library. 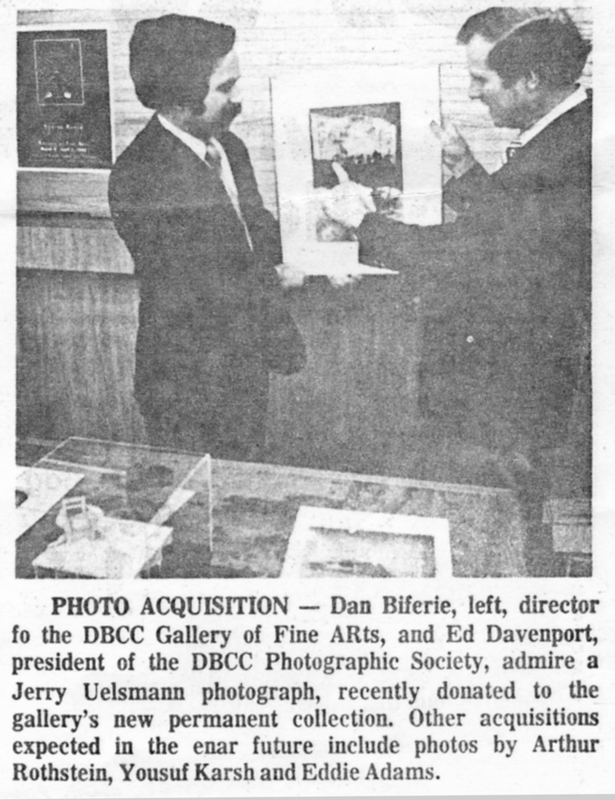 By 1977, Biferie succeeded in convincing DBCC's president, Dr.Charles H. Polk, that a larger, more permanent and appropriate art space was in order. The current, 1,100 square-foot fine arts gallery was carved out of the lobby of the Goddard Center for the Arts. Once he had the necessary space with the requisite standards for showing photographs, Biferie faced his second hurdle: to fill the gallery with top-notch art and create the sort of outstanding photographic program he had envisioned. He now needed to attract the artists whose work he wanted to show and whose ideas and methods he wanted to share with participants. The gallery acquired its first photograph in 1978 when internationally renowned photographic artist Jerry Uelsmann donated one of his images. This was followed by gifts from other artists. A grant fro the National Endowment for the Arts and gifts from noted collectors spurred the Gallery's budding collection, and in 1992, the Southeast Museum of Photography officially opened its doors. The museum is now one of only 13 facilities in the US dedicated exclusively to photography, and one of only a handful of such institutions nationally that share a scope, reach, and depth of collection and activities in this specific field. In 1991, when the final preparations for the new space were underway, Daytona Beach Community College hired Allison Nordstrom as Director and Senior Curator for the newly minted Southeast Museum of Photography. From 1991 to 2002 Nordstrom curated, installed, and opened hundreds of photographic exhibitions. This era of the museum also saw significant growth in the collections. The small but budding collection of the 1980's saw growth of over a thousand percent by the late 1990's. After Allison Nordstrom's departure in 2002, photographer and academic Kevin Miller took the helm of the museum. During Miller's tenure the museum adopted AAM protocols for collections management and underwent a Collections Assessment Program. On the heels of this assessment, in 2007, SMP moved to a new contemporary, multi-purpose complex at the main Daytona campus entrance of Daytona State College, directly on International Speedway Boulevard; giving the museum a high profile in the community on one of the most-traveled public streets. This building was designed specifically to house the growing collection of the museum and offer plenty of wall space for gallery exhibitions. The landmark cultural complex enhances the museum’s ability to serve the community, the region and visitors to the area. The Museum has received significant recognition, including grants from the National Endowment for Humanities, the Florida Humanities Council, the Florida Department of State, the NEA and the Institute of Museum and Library Services. Support for exhibitions, artist exchanges, and museum projects has also been received from charitable trusts, foundations and corporate donors as well as from foreign governments. 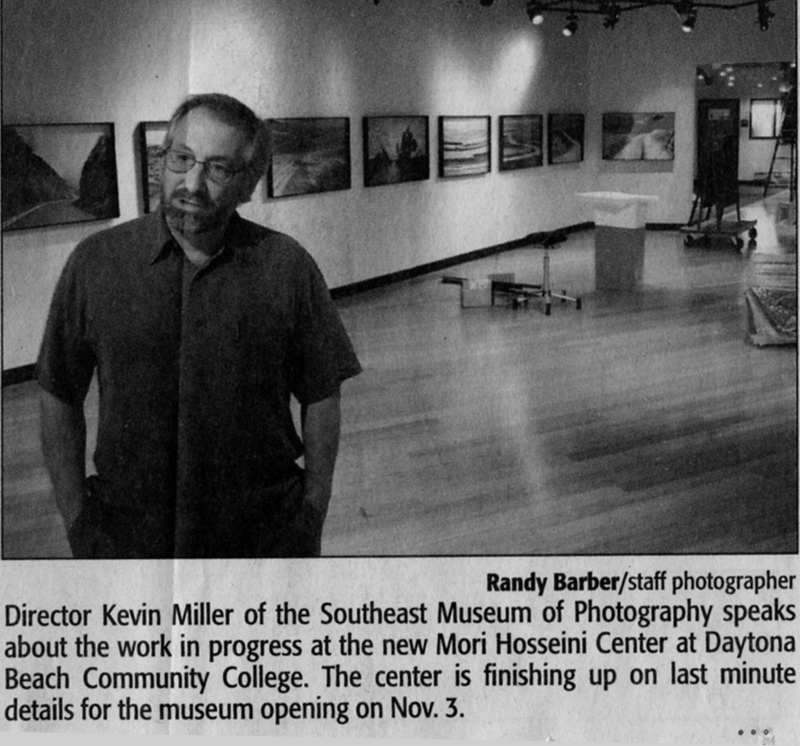 The Southeast Museum of Photography holds a very close relation with Daytona State College's photography department and organization known as the Southeast Center for Photographic Studies. Together, the Southeast Center for Photographic Studies and the Southeast Museum of Photography provide Daytona State College students, residents of Central Florida, and photography lovers all over the world with rich and diverse educational opportunities in state of the art facilities. Museum Director Juliana Romnes and her father Per Hans, a photography instructor at Daytona State College. Picture taken from Daytona Beach News Journal, 2000. In 2014 when Director Kevin Miller took a full time faculty position at the Southeast Center for Photographic Studies, then Exhibitions Coordinator Juliana Romnes took on the duties of Interim Director. Ms. Romnes built upon the Southeast Museum of Photography's stellar exhibition legacy, coordinating the engagements of photographers such as Rick Lang, Lee Dunkel and Brad Temkin. Juliana also continued to grow and direct the museum's collection through acquisitions and donations, careful to implement the museum's collection strategy and protocol. Romnes also created a museum advisory board that has since overseen the more recent transitions. In 2016, after completing her Master's Degree, Romnes left the museum to pursue a career in non-profit management.